In conjunction with the G7-science meeting in Turin, scientists of LIGO and Virgo collaborations just announced the observation of gravitational waves emitted by two merging black holes. For the first time, three detectors made this observation simultaneously thanks to the start of Advanced Virgo on the 1st of August. This triple observation improves the sky localisation of the gravitational waves sources. Black holes are the ultimate stage of massive stars evolution. They sometimes constitute systems of two black holes orbiting around each other. As they get closer, they lose energy in gravitational waves form. This phenomenon then accelerate until the black holes merge into a unique one. The two black holes whose merger was observed on the 14 August were respectively 25 and 30 times heavier than the sun. This event emitted gravitational waves that spread through space during 1.8 billion years before their detection by the two Advanced LIGO detectors (in Washington and Louisiana, United States of America) and Advanced Virgo near Pisa, Italia. This kind of final spiral was observed three times by Advanced LIGO detectors in 2015 and early 2017. 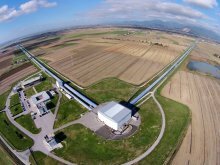 The 14 august event was observed by Advanced LIGO too, and also by Advanced Virgo during its first data taking (read the article). The addition of a third instrument allows to inprove significantly the localisation of the astrophysical events at the source of gravitational waves. 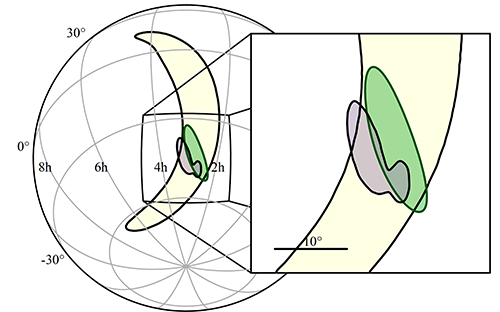 The use of two detectors enables to locate the event at the source of gravitational waves in a sky area equivalent to several thousand times the surface of the full moon. With the addition of Advanced Virgo in this network, the area becomes ten times smaller and the estimate of the distance of the source is twice as good. Therefore, the chances to observe an associated signal with optical telescopes are greater. Figure : localisation, in the sky, of the event observed on 14 August. Thanks to the input of Advanced Virgo, the size of the area is now ten times smaller. Yellow : localisation given by both LIGO detectors. Green : localisation given by the in real time analysis of data from all three detectors (LIGO and Virgo). Purple : more precise localisation given by further analysis of data. Another asset of Virgo detector is its orientation. It is different from the orientation of LIGO instruments and provide complementary information. This makes possible new tests of Einstein’s general relativity theory, known to describe the gravitational force which rules the Universe. LIGO scientific collaboration works together with Virgo collaboration. Since 2007, scientists of both groups analyse data jointly and sign discoveries together. The LAPP team is highly involved in all the scientific aspects in Virgo project, with high responsibilities in the conception, the realisation and the installation of the detector. The team is also involved in data analysis and play its part in the data collection. Frédérique Marion, team manager of the Virgo group at LAPP was involved in the press conference in Turin, together with other team managers of LIGO and Virgo.